I used 1/2 cup apple puree with 1/4 sugar. great results even less calories! I just made this bread. I added golden raisins and omitted the pepitas. Delicious! I`'m trying this recipe for the first time. I just put the bread pans with batter in my oven to bake. The batter tastes really good, so I'm sure the bread will be wonderful. I can't wait to try it. 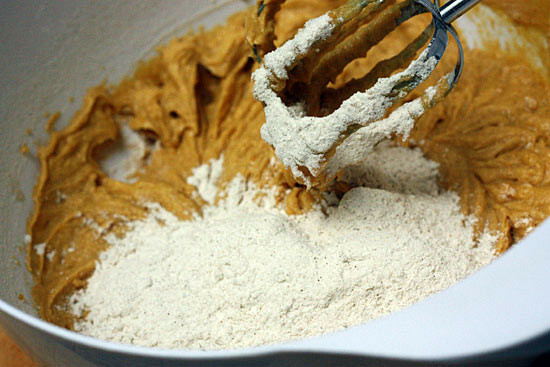 We make pumpkin bread every Christmas, but this is a MUCH healthier recipe. Thanks so much for sharing it. I so enjoy your site. I've been making a different recipe for pumpkin bread but I am eager to make your recipe this year. 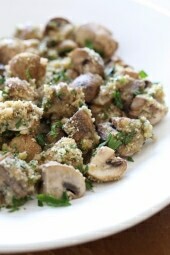 My question is can I add chopped nuts into the mix and would this change the cook time? Love all your recipes, been using skinny taste for 2 years and have introduced many of my WW friends and they love it too!! Thanks for the recipe. I had a squash on hand, so I roasted that and made the puree. I had to add a 1/2 cup of apple sauce to the puree since it was so think. Made the rest of the recipe as stated. Wonderful! Love this bread! I was trying to create a healthy one of my own. Waste of time-duh I should have checked skinnytaste for a recipe in the beginning. I used Bob's Red Mill white whole wheat flour and just cut down by 1/8 cup. Used applesauce instead of oil. This is awesome!!! Thanks for all the recipes you share. Couldn't be successful on WW without them! Hi! Could you substitute the all purpose flour for whole wheat flour? If I substitute the all purpose flour with whole wheat flour would the cooking time or moistness of the bread be affected? The same thing happened to me Aimee Reeves! I made this last year and it was fabulous; I've tried to make it twice this year and it keeps coming out super gooey and not done even after an hour. What happened?! Any chance it should have baking soda in it? I just tried making this today and it did not turn out right at all. I was so sad. I followed the directions, however, the bread turned out super gooey! :( It was burnt on the outside and gooey on the inside. I have a gas oven and it gets very hot quickly. I made two loaves and the second one I baked at a lower temp, however, it was still just as gooey. Not sure what happened. Made this yesterday but instead of pepitas on top I mixed in 1/2 c. semi sweet choco. chips. Delicious! I am about to do this with mini chocolate chips – adding a cup to the recipe brings the points plus up to 4 per slice. I think it's going to be a WINNER. I made this and enjoyed it but it was also very dense for me…my batter was much more thick than yours however, my blender is cheap and it's "low" speed is not low enough so maybe that is why. One question: In the picture of you putting the canned pumpkin into the oil, eggwhites and vanilla, it looks like the liquid at the bottom of bowl (under the pumpkin puree) is white. I am wondering if I missed anything in the directions or ingredients??? I am also interested to know if applesauce can be substituted for the oil. Also, can splenda be used instead of the sugar and is it the same amount? Can't wait to try this recipe! I've made this three times in the past 2 weeks. It's SO good. Just made this and it is awesome! I used King Author whole wheat white flour! Very moist! I'm making muffins instead of the bread- any idea on cooking time for muffins? Fantastic recipe! Made it the night before, stuck it in the fridge, and baked the next day. Moist and delicious, even without the pepitas! Next time will try with cream cheese batter on top. Thank you!! Splenda sugar works well, I just added bit of agave too just to be sure. Also, if out of Pepitas, granola is great on top of the pumpkin loaf. Anyone have an idea on how I could use stevia instead of sugar? Unfortunately I have to do GF and Sugar-free! I made this last night but substituted King Arthur Whole Wheat Flour instead of the all-purpose and it was AMAZING! I was worried it might come out dry but it was delicious! I wanted to eat the whole loaf it was so good! Made this recipe hoping it would at least come close to "regular" pumpkin bread in taste and texture. I am pleasantly surprised to find that it is actually BETTER than any other pumpkin bread I've ever baked, and it has about half the calories and less than half the fat. Amazing! MMMMmmmmm! What a great recipe! I tried it and my family is in love! It is very moist. Thank you- will be making this for many more times to come! Have frozen puree and some cranberries I need to use.. .found this recipe and can't wait to make it! Going to omit the pepitas and add the berries to the batter. MMM!! I've made 2 loaves and they seem a little un-cooked in the middle. Is this just a side-effect from how moist the pumpkin makes this bread? I did end up using a full can of pumpkin which is about 1/4 c more than recommended. I think it's because you used more, I tested this one many times so changing it will alter the final results. Awesome recipe! I substituted 1/2 cup of wheat flour, used 2 whole eggs (because I was too lazy to separate them) and added a teaspoon of baking powder and the bread still turned out moist and yummy. I hop eyou have a Happy Thanksgiving! I just made this. I have already had three pieces. oops. It's sooo good and I'm a pumpkin bread addict. I cut the slices a little thick though. I was in a hurry. My first ever homemade pumpkin bread. I took pictures too. haha! It was a typo, it's 1 tsp. I fixed it! I just made this last night for thanksgiving, and now see the 1 T v. 1 tea comment. Should I remake it? Has anyone tried freezing this? I was trying to get my baking done for thanksgiving done this weekend to freeze and take out the night before. After making this for family a month ago, it is being requested for dessert at our big meal. I sometimes make the recipe with two egg whites and sometimes I just use one whole egg, turns out great either way. Instead of pepitas I've started using walnuts, super yummy! Thanks for another fantastic recipe!!! I love the taste of this bread! But I am having trouble getting it to rise. I am trying to figure out this whole baking powder vs. baking soda thing. Why are you using baking soda when there is no acid in the recipe? Other than increasing the spices (I don't use premixed spices – I just use the individual spices so I can control the flavor of each) and (totally by accident) adding 2 tsp baking powder, this turned out AMAZING!!! 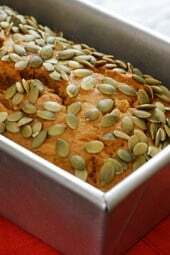 I am new to healthier cooking and this was my first recipe to try on here (my 5 yo son asked for pumpkin bread – it must be fall), and we are both very impressed! I am also going to try making this again, but with bananas in place of the pumpkin (I don't have everything I need in order to make your banana bread recipe, so I am going to improvise). Thank you so much for posting this! I will be sure to try more of your recipes! The banana bread just came out of the oven and it, too is awesome! I will definitely be making this (with my slight alterations) my go-to recipe! Thanks! This came out great, thank you for the recipe!! I was out of nutmeg, so I used a little more cinnamon and some allspice, and it was quite tasty. I love the texture. 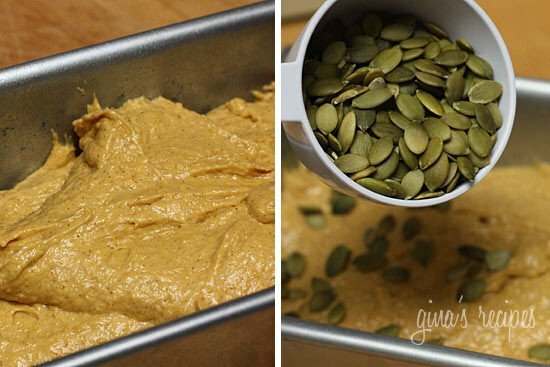 A better than the original substitute for Starbucks Pumpkin Loaf. Tried this Pumpkin Bread tonight and it was wonderful!! Didn't make it with the pepitas since I didn't have any. Thank you so much for all the wonderful healthy recipes!! They're helping me so much on my journey to lose weight and get healthy. I had to double this recipe as there wasn't enough to fill my loaf pan, but it is amazing! I made it last night and my five-year-old son, who picks at ALL his food, has already eaten half the loaf. I actually came across this recipe while I was looking for a low fat, creamy, mushroom and wild rice soup recipe, which I found on your site and made yesterday – and he ate his whole bowl and asked for seconds. I think I'm going to be a frequent visitor 😉 Thanks! I have made this twice now and it tastes great. But the bread does not rise much. It is about 1.5 inches tall. Is that what it should be? This recipe was so easy and the bread was fantastic! My husband went nuts for it, and my friends three year old ate three pieces. He kept saying it was mmmmmm. I Love your site, it makes living a healthier lifestyle so much easier. Thank You!!! Gina this recipe was the BOMB. Seriously these turned out to be soo good. I substituted stevia for the sugar and added old-fashioned oatmeal and cacao nibs in place of the pepitas and it turned out to be amazing!! Thank you so much for sharing. This bread is so good. I made a half batch and used mini loaf pans. I made this recipe as mini muffins and they turned out fantastic. I didn't have the pepitas on hand, so I just made it without them. They were still delicious. Thanks Gina! This came out so good! I just made it and my house smells amazing. 🙂 I couldn't even wait for it to cool and had to try it. I'm not normally one to love everything pumpkin like a lot of people but this has made me a pumpkin lover! Thanks for the update on the baking soda. I thought it tasted a little funky! I think I made a mistake, it should have been 1 tsp, not tablespoon, I'm remaking thus tonight to be sure. So sorry! Hi, Gina, I love your recipes. I just tried this recipe today and it does make the kitchen smells great. However, my loaf tasted very "sodaly" and wondering if 1 tbsp of baking soda is the right amount. Thanks. I had a problem with the baking soda taste. It was really strong. Wish I would've seen the comment about cutting it in half. Next time I'll try that. On my second batch of the week, can you say "Yum"? lol my boys are eating these up faster than I can make them :0) Thanks Gina!! I cut the baking soda in half and it worked out great! This was *absolutely* one of the best quick bread recipes I've ever made. Thanks for sharing! I was so excited to make this! I love Pumpkin Loaf and I am trying not to give $$$ to Starbucks this month. Mine came out a little bitter, I went back over the recipe and I don't think I messed anything up! Maybe I should just give up baking, as I also made your Spinach Lasagna rolls today and they were perfect! I wanted to make some lowfat chocolate chip pumpkin muffins today, so we used this recipe as the base. I omitted the pepitas and put in about half a bag of mini-morsels (the Nestle's semisweet kind). I got 12 normal muffins and 12 mini-muffins out of the recipe. They are dense and moist – delicious! I used 1 tablespoon of baking soda, as listed, and that is all I can taste. Is it supposed to be that much baking soda? I know it's a year late, but it's one TEASPOON, not tablespoon. That would make a big difference! Just made this for out-of-town guests this weekend. Delicious! I swapped out the pepitas and used some pumpkin spice granola I had on hand instead. Turned out great. I made this an absolutely loved it..So moist! I added dark chocolate chips and removed the peppitos and got raves from family and friends! 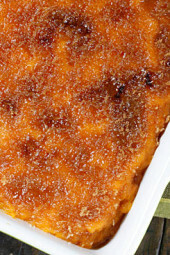 I always substitute applesauce for oil when baking, does anyone happen to know if that would change the WW points value? I almost posted about applesauce, and now Im going to do that. 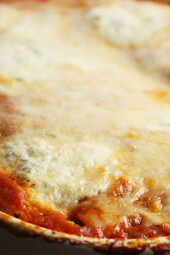 Yum, I would love a piece of this right now! I have a lot of apple recipes here, apple butter, apple crisp, baked apples, apple and grape medley and more! Plus more coming soon! Okay Gina, it's in the oven. I changed the recipe to what I had available and put 1 whole egg plus a white. I also used whole wheat flour and dint have baking soda so i used powder. I will let you know what happens! I just made this today – loved it and my kids inhaled half the loaf when they got home from school for after school snack. Low fat and delicious! Perfect combo! Very tempted by the pepitas b/c I bet they are delicious but I knew the kids wouldn't go for them 🙁 Thank you for another keeper!! Help! All these pumpkin recipes look great, but I have 5 bags of apples ready to make something wonderful with! What are my chances we will see some apple recipes soon? LOVE your site and will be making this bread today (also have pumpkin in the fridge that needs to get used up)! I bet your kitchen smelled delicious :] This looks great! I love that you can indulge in this Fall favorite for a reasonable amount of calories! YES!! 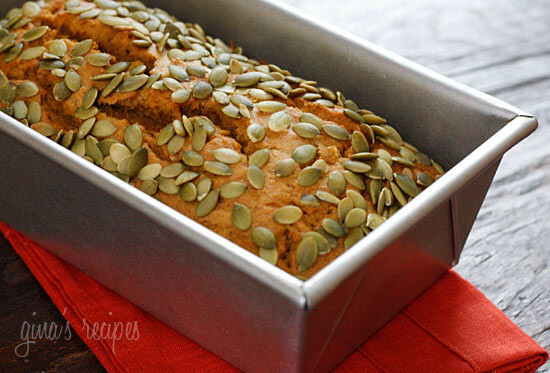 What a GREAT pumpkin bread! Your photos are terrific and the pumpkin seeds on top look perfect! Thanks so much for posting this one! Those are pepitas, not pumpkin seeds. The pumpkin seeds do sound like they would be nice on top of the pumpkin bread, though. Lucy, you are incorrect. Pepitas and pumpkin seeds are one in the same. I just made these and they are amazing! Super moist! My 2 yr old and 10 month old loved them too. I've tried so many amazing things since my friend told me about your site last month! Thanks Gina! Without the pepitas the points would not change, but you could change the serving size to 13 servings per loaf and get a bigger slice for the same points value=3 points. Its not a big difference, but since I can't eat pepitas anyway (too hard on my crappy teeth) I thought I'd figure it out. I put in in the etools recipe builder. I dont think the points would change with whole wheat, not sure about the pepitas. It's such a small amount per serving. Any oil would work and I'm sure this freezes ok. The baking soda should be right… I hope, now u have me second guessing myself. I made this several times before posting. This is incredible! Pumpkin is really a great treat for Halloween! It is not only the month for Halloween, but breast cancer awareness month!!! Treat yourself or a loved one because you care! I am just stopping by with a reminder to do your self breast exam. Just got done making this, it was amazing. I brought it to the teacher who i'm doing my practicum with and it was a hit. Thanks for the A! would making it with whole wheat increase the point value? Is it really 1 tablespoon of baking soda? Just want to make sure, as most other quick breads use teaspoons. I hope this helps some of you that said they cannot find pumpkin spice. have a great day, and thanks Skinnytaste for all these great recipes. Wow this looks so good! What about using Canola oil instead of Vegetable, would it matter? This looks delish! I'm such a sucker for anything pumpkin. Does the points value change if you leave out the pepitas? can I substitute pumpkin spice? I can't find anything like this in Poland. Love the idea of granola on top. Thanks Trying to change me, for answering the pumpkin spice answer, that is correct! I also can't seem to find pumpkin spice in the grocery so I thought I'd make some from scratch. But I thought pumpkin pie spice has ground clove in it? Should I add some clove to the above spice recipe? Did the spice you use have clove in it? Um…the above recipe DOES have cloves in it. 1/2 tsp cinnamon, 1/4 tsp each nutmeg and cloves. I love pepitas! Great that you put them on top. oops, as I was pouring the batter into the pan, I realized I never used the vegetable oil. I assume it goes in with the pumpkin puree and the other liquids? Think I might try this with lowfat granola sprinkled on top instead of the pepitas and may make it into muffins! Can't wait! Thanks for the idea of topping with granola, Michelle. I think that sounds great; I just made a new batch this weekend. Just last night, I was thinking, "need to google a healthy pumpkin bread recipe" … and here it is 🙂 I'll have to make it today 🙂 — thanks! I made this with mashed sweet potatoes leftover from last night instead of pumpkin and walnuts instead of pepitas. Wow! It is so good I am giving a bunch to our neighbors. I can't eat the whole loaf!! I have now made SO many of your recipes Gina and they are all phenomenal. Thanks so much! Pumpkin pie spice is a mixture of Cinnamon, nutmeg and cloves. I would do 1/2 of Cinnamon and 1/4 each of the nutmeg and cloves. For example 1 teaspoon of pumpkin pie spice would convert to 1/2 teaspoon of cinnamon and 1/4 teaspoon nutmeg and 1/4 teaspoon of cloves. Yummmy!! 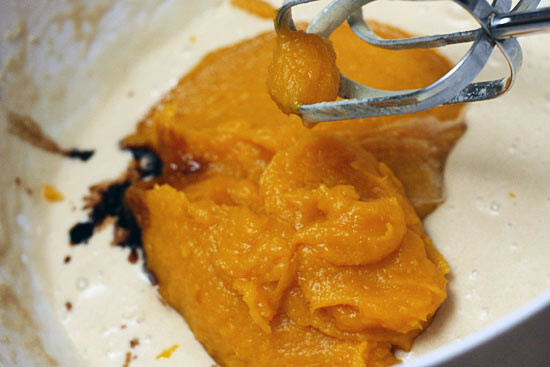 wonder if you could substitute your pumpkin butter and just cut the suger and some spices? I guess I'll give it a try and let you know! Thanks for the super yummy recipe once again! If I don't have pumpkin spice what can I use instead? I am so happy it's finally pumpkin season! I always try to roast several and freeze them into 1 cup portions for year round pumpkin recipes like this!